The operational pilot in Leicester is a Vehicle to Business pilot, located in the UK. 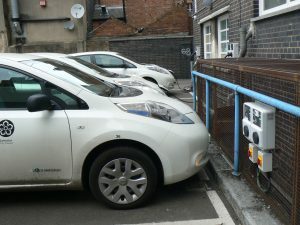 The project demonstrates controlled and bi-directional charging at the office of City of Leicester. The City of Leicester, located in the UK, has joined the UK 100 group of cities and towns in pledging a transition to clean energy sources by 2050. To do this, City of Leicester has installed solar panels, to provide a local, cheap source of renewable energy for houses and council premises. On their own City Hall, they installed 90 solar panels on the roof. These generate energy, which the office uses to turn on their lights, computers etc,. In total they provide 2,5% of the office building’s energy consumption. But also electric vehicles can be charged with the energy coming from the roof. Leicester is undertaking a gradual replacement of the diesel cars and small vans in its fleet, with electric equivalents. Four electric vehicles are now based at City Hall, used by staff to support a range of council services. The Electric Vehicles can charge without using energy from the grid. To improve the energy autonomy and to avoid grid investments, City of Leicester uses two storage elements; a static storage and batteries in the EVs. By using these elements, the EVs can charge and discharge day and night at the office of City of Leicester. This allows the City to avoid grid investments 24hours. An installed system then prioritises if the solar energy will go into one of the electric cars, go into the office, go back to the grid or go into a static storage system. Controlled and bi-directional chargers take account of when the charging is happening in terms of grid capacity and associated energy costs. Prioritising PV generation for EVs will lead to an increase in ultra-low emission kilometres, powered by a locally produced renewable energy source. For instance, between June 2016 and June 2017, the EVs used 2,996 kWh, which equates to 15% of the annual solar production. The system is considered as highly replicable, with applications identified at several locations: at other city offices, but also at bus stations, multi-storey car parks or park & ride sites. As well, the pilot contributes to the development of a commercial business case for bi-directional charging.